Very dense foliage and masses of pink to red flowers Thymus serpyllum Coccineus is commonly called Red Creeping Thyme. 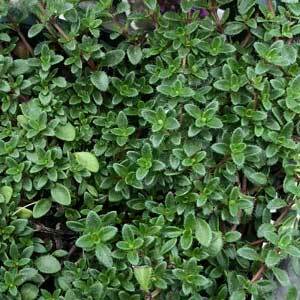 This is a very low growing creeping variety, aromatic foliage and attractive both when in flower and through the year. The foliage itself is small and rounded, the flowers appear above on short stems from summer to autumn. This is a very useful plant for filling in between pavers as well as for growing as a ground cover. A few suggest that it could make an alternative lawn, however it would need to be a very lithely trafficked area to work. This is a plant that can be grown in a container, either by itself or to underplant taller shrubs. If planted in a sunny position in well drained good quality soil you will have very few problems. This is regarded as a drought tolerant plant once established, and is easily propagated by division. In long dry periods some extra water will be needed to keep the plant looking at its best. The occasional deep soaking will be of most benefit. A little liquid seaweed fertiliser in spring, or a half application slow release general purpose fertiliser once a year will be beneficial. Little to no pruning is required. 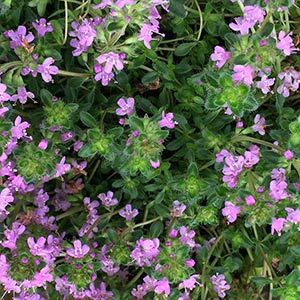 Common Names – Red Creeping Thyme. Spread – Will spread to around .5 metre.